Footage Films recently send us over information for their upcoming DVD release of "Will to Love". 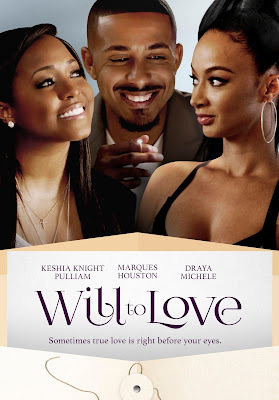 The film stars Keshia Knight Pulliam, Marques Houston and Draya Michele. "Will to Love" hits retail on October 6th. Jamal Hawkins is a handsome bachelor who will soon be a very wealthy man. As the primary heir to the “Let It Roll” toilet paper corporation, Jamal is set to inherit his grandfather’s empire. Jamal’s world comes crashing down when he discovers that his grandfather has placed a stipulation on his inheritance. The bachelor must find a wife before his grandfather passes away within the next 90 days. As a man who doesn’t believe in marriage, Jamal is lost on what to do. Matters are further exasperated by Jamal’s conniving half sister, Monica, who calculates a way to steal the corporation right from under her sibling’s nose. In an effort to help, Jamal’s best friend, Danny, devises a plan to fool Jamal’s family and find a suitable wife as soon as possible. With the aid of his new secretary, Rachel, Danny’s one time fling, the trio comes together to hold a casting call for women of all shapes, types, colors and creeds, that might meet his grandfather’s high standards.